My Cozy Corner: Yay! We had Snow. around seven in the morning and started raining at nine. I walked outside in my PJ's and snapped these photos. snow falling in two hours. clean up the grape vines and plant some bulbs. 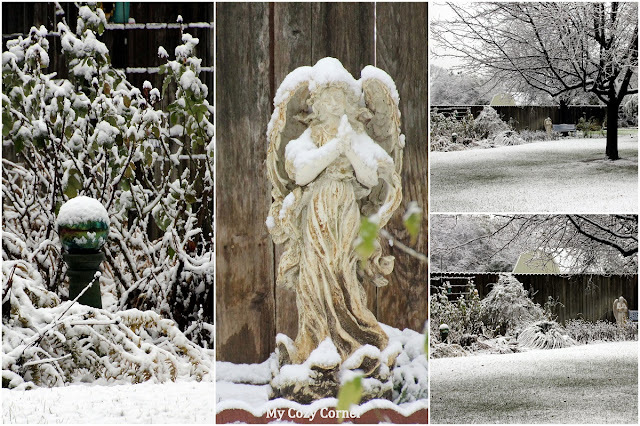 The garden decor is so beautiful covered with snow. but a hint of blue paint is still showing through the snow. A mosaic to Save on Pinterest. Beef Barley Soup to enjoy this weekend. for over four months steadily. Betty, as you may know I totally love snow - and seeing yours made me smile. I can't imagine going years without seeing it - wow. Lovely pics - and barley veggie soup is a fav of mine - just had it a few days ago - didn't make, just had, haha, need to get to making some. Hope your new year is going well so far. Big hugs!